On January 23, it was snowing so hard that the sound, the roaring hiss of snow hitting the ground, woke me up at 3 a.m. I threw on a jacket and walked outside into the certain knowledge that California’s nearly five-year snow drought was over. It was the deepest, most stacked I’d ever seen my neighborhood in Mammoth in 20 years, or any neighborhood. Anywhere. Ever. Four feet had fallen in the last 48 hours, an almost continuous blasting, and now someone had turned the dial up to 11. The trucks we had spent all day digging out were gone, the neighbor’s house was gone. The world was nothing but white, and it was snowing so hard that I could feel the mass of it pressing me down, an urgent new gravity. The next morning, Mammoth Mountain’s ski patrol reported 33 inches in 24 hours, 77 inches out of that four-day cycle on top of 180 inches that had fallen continuously since January 4. We got a break for a week, every day of which was spent shoveling out our town, and then on February 2, it fired back up; we’d get another 160 inches before the storms finally tapered at the end of the month. 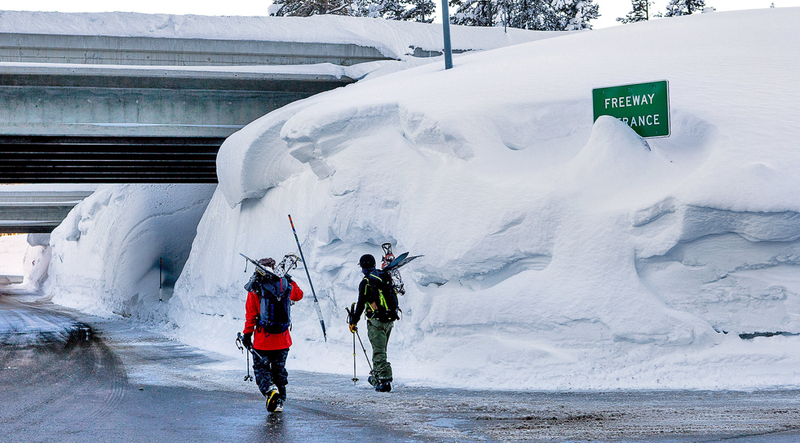 In less than two months, the town of Mammoth Lakes got about 400 inches, or 30 feet, of snow. That’s what Vail sees at midmountain in an entire (good) season. 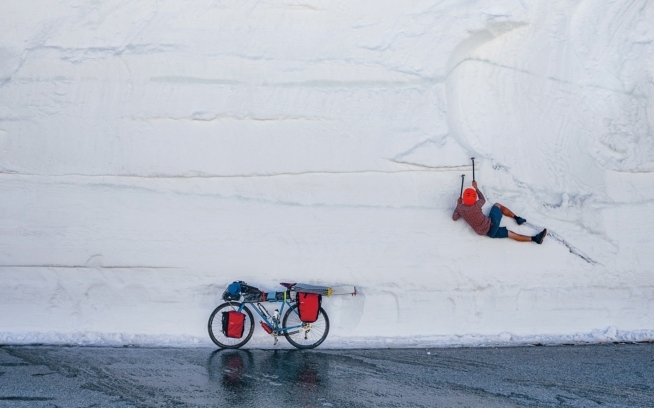 But this was no Colorado fluff—a glacier had landed on us. Higher up on the ski area and in the big mountains it snowed far more. And the wind loaded it, and the avalanche debris accumulated. And just like that, the Sierra was alive again. The drought was done (fingers crossed). I probably shoveled more than I skied in January and February, but it didn’t matter because everything made sense again. Get up, dig, change into dry clothes, dig more. On the ski area the staff was doing the same thing, frantically trying to keep up with the storms that eventually swallowed up whole chairlifts—towers, cables and all. When we could finally get into the backcountry, it was a new world, distorted and mutated into a topography that swelled and bulged sensually, all the angles softened and edges sanded away. Huge cliff bands had disappeared, entire slot couloirs transformed into spacious bowls, and new lines and new possibilities made a mockery out of our understanding of the mountains. Everything was in, from ephemeral tightrope walks off the summits of eastside 14ers to obscure lake-level hits in Tahoe. Skiing itself had changed during the drought years, as more and more people have awoken to the possibilities opened up by modern alpine touring gear, and the formerly obscure secrets of the mountains have become available to all via guidebooks and social media. When the skies cleared in March, it wasn’t just your standard post-storm frenzy in the Sierra, it was the release of four years of repressed desire now aided and abetted by ultralight gear and the World Wide Web. Mammoth photographer Christian Pondella and Tahoe’s Jim Morrison (among many others) went bonkers in the big peaks south of Mammoth, gleefully attacking dozens of king lines, like the Giant Steps on Mount Williamson, perhaps the biggest descent in the range. 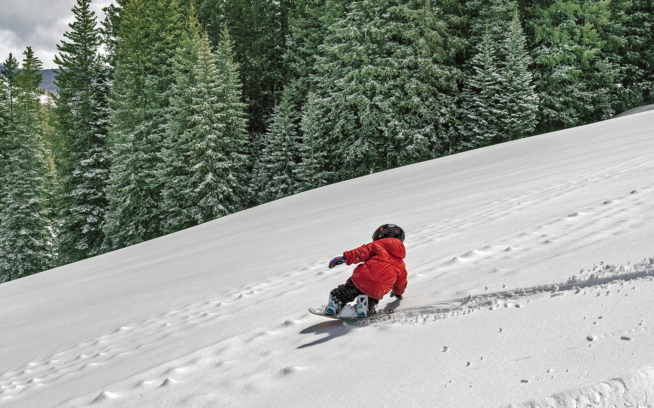 A 9-year-old skied McConkey’s (Eagle’s Nest) at Squaw Valley. Mammoth guide Mark Shelp put in two solo descents on a heady conceptual line he linked up on a Tioga Pass wall that I could have sworn was 3,000 feet of bare granite. The Mendel Couloir was snowboarded. Jed Porter drove out from Wyoming and repeated the legendary Redline Traverse, a 125-mile, 80,000-vertical-foot ski tour from Mount Whitney to Mammoth first established by the late Allan Bard, Tom Carter and Chris Cox in the early ’80s. 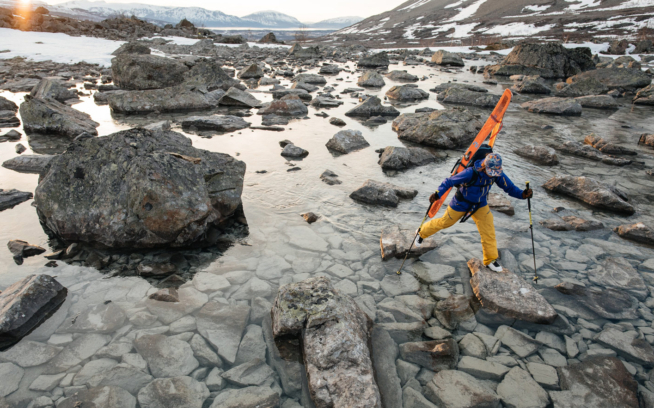 Porter skied 25 peaks on his 16-day odyssey. Name a coveted/prominent/long/extrasteep line: It got skied. But the names, the numbers, the angles and dangles, that’s not the point of skiing in the Sierra. The gear is different now, the knowledge so much broader, but we’re still playing thesame hedonistic game invented by Bard and company in the late ’70s and early ’80s—putting wings on our feet and sliding down mountains in John Muir’s vast church of pleasure. There is no scorecard here—everybody wins. This story first appeared in the January 2018 Patagonia Catalog. Hans Ludwig is a senior correspondent for Powder magazine, where he writes the Jaded Local column, covers women’s ski racing and attempts to expense enormous bar tabs. A resident of Mammoth, he skied his first Sierra couloir in 1993 on a pair of 208 GS skis.